Last week, while I was in the middle of working on assorted posts related to the Liliha Library Anime Art Contest (and yes, part 3, featuring pictures from the awards ceremony last Saturday, is still coming — probably in the next week or so), Kawaii Kon made one of the most awesomest guest announcements EVER. 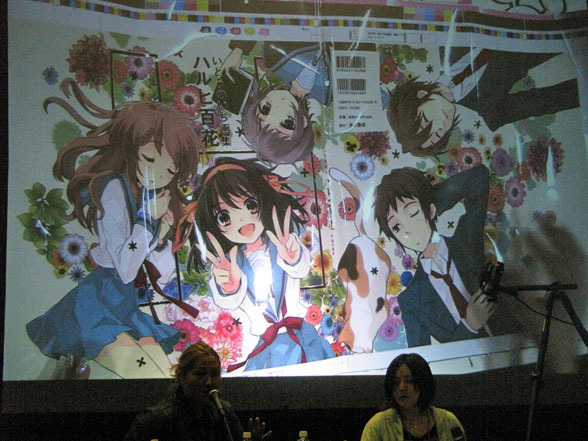 You’ll have to excuse me for dropping any veneer of journalistic objectivity in favor of pure fanboyish glee, because that announcement just happens to involve Noizi Ito, illustrator and character designer for The Melancholy of Haruhi Suzumiya. 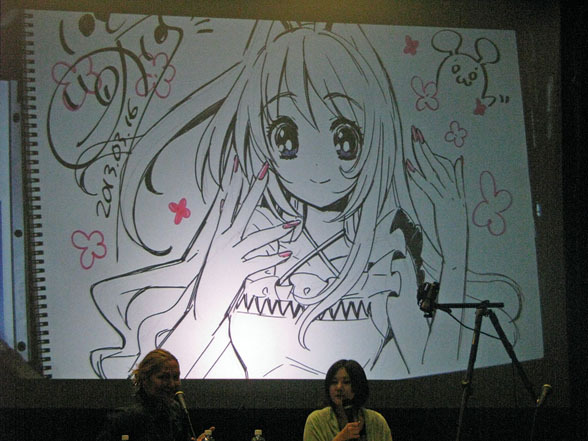 Ito also did the character designs for Shakugan no Shana, but OMG WHO CARES THIS IS THE WOMAN WHO CAME UP WITH THE LOOKS OF HARUHI, MIKURU, YUKI, KYON AND EVERYONE ELSE IN THAT SERIES. The few dozen of you who’ve stuck around to read this blog regularly know that I have a thing for anything related to Haruhi and will mention that fondness in this space pretty much every chance I get. (It’s been just as much of a running punchline here as, you know, that book.) I love how recognizably distinct she made each of the characters look in that series. 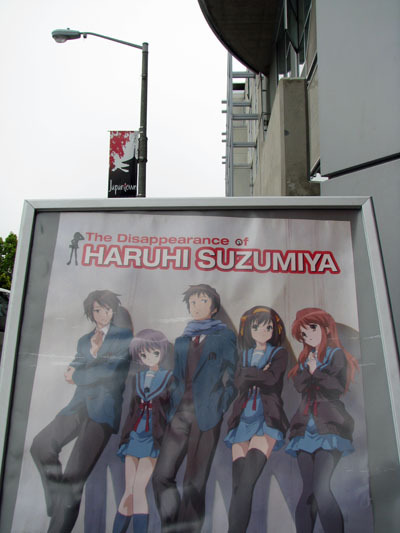 This will be Ito’s second American anime con appearance; her first was at Sakura-con in Seattle in 2010. Here’s a “Drawing With Wacom” video of her in action. Ito joins voice actors Johnny Yong Bosch (who’ll also be bringing his band, Eyeshine), Todd Haberkorn, Colleen Clinkenbeard and Lisle Wilkerson as guests for this year’s show, scheduled for March 15-17 at the Hawai’i Convention Center. To register, visit kawaiikon2013.eventbrite.com. A bit delayed this week — blame a combination of “mental health preservation holiday”-related lethargy and the usual big horking pile of stories to copy-edit and/or lay out at work — so some of these events may either be going on right now or be finished by the time you read this. Aiea Library book sale: Book sales are really a media treasure hunt — you never know what you’re going to find. There could be an out-of-print manga volume that you need to complete your collection, or a Pokemon strategy guide in Japanese, or something completely different that you totally want right now. Find your passions here. Presented by the Friends of the Aiea Library and the Aiea Community Association at the library, 99-143 Moanalua Road. 10 a.m.-3 p.m. today. “Friends, Books, Music … The Sale!”: You know all that stuff I wrote about the Aiea Library sale above? Apply it to this sale, presented by the Friends of the Library of Hawaii, except on a waaaaaaay bigger scale. Visit the Friends’ warehouse in Kakaako, which is ewa (west) of the UH medical school; just go makai (south) on either Forrest Avenue or Keawe Street to the end, and you’ll be there. Visit www.friendsofthelibraryofhawaii.org. 9 a.m. to 4 p.m. today and Sunday and 9 a.m.-3 p.m. Monday. Aiea Library Anime Club: This month, librarian Diane Masaki is screening the always popular Black Butler, which beat out Summer Wars in a fan poll. (Quick blogger commentary: Don’t get me wrong, I love Black Butler, but over Summer Wars? Are you kidding me? Boo, you heathens. Boooooo.) For more information or to RSVP, call 483-7333 or e-mail aiealibraryanimeclub@yahoo.com. 3 p.m. next Saturday at the library, 99-143 Moanalua Road. MangaBento: This group of anime- and manga-inspired artists usually meets every second and fourth Sunday of the month at the Academy Art Center, 1111 Victoria St., Room 200. Visit www.manga-bento.com. Next meeting: 1 to 4 p.m. Jan. 27.